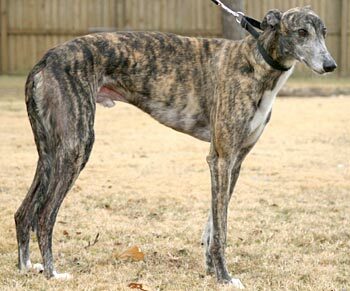 Fido, aka Fido In Motion, is a 2-year-old brindle male born November 20, 2005. His sire is Dodgem By Design, making his grand sire Gable Dodge, and his dam is Marie In Motion, making his grand sire Molotov. Fido, Elmo, and Cara are siblings. 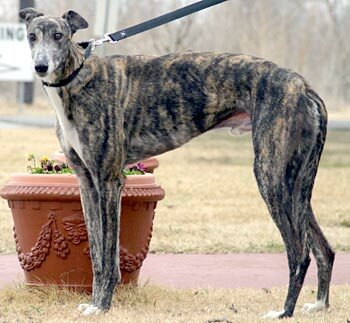 Fido's 9-race career started on July 3, 2007, at Dubuque race track in Iowa and finished on December 12, 2007, at Valley Race Park in Harlingen. 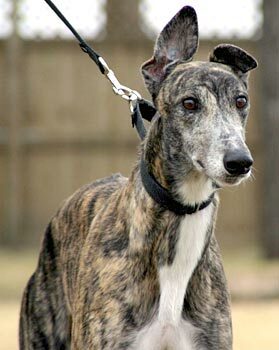 Fido has hung up his racing paws and is now looking for his forever home. Fido's small animal test: Fido got in a sniff of the cat with and without the muzzle. Zero interest beyond that. Later, the cat walked down the hall in full view. The regular hounds of the house ignored him and so did Fido. He did see the cat amongst the other dogs, though. Fido didn't pay much attention to a Dachshund during play time at the kennel. Fido is cat tolerant, but may need further introduction to small dogs.